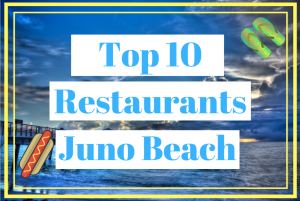 With the first of the Top Ten Lists, we start off in lovely Juno Beach, and what better place to start than the places that feed our hunger, all the local restaurant hotspots. From 25+ years experience in the area, these 10 places have left my stomach full and satisfied every time I go. Check out the links in the descriptions for websites as well as Facebook pages. Ke’e Grill is named after a beach on the Hawaiian island of Kauai; the market umbrellas and the marlins mounted on the wall add to that island theme. The ambiance is relaxed and the décor is tropical—featuring bamboo on the walls and surrounding the bar. This is the top-rated restaurant in Juno and has been a staple in the community for the past 20+ years. Try the spinach maria, you won’t regret it! 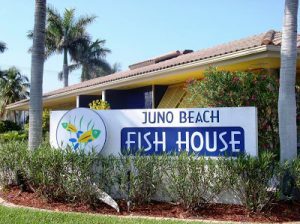 The Juno Beach Cafe is a family-owned, breakfast and lunch restaurant that has been serving satisfied customers since 1988. 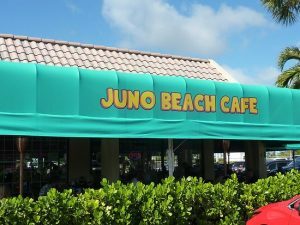 If you are looking for a place to start your day or trying to grab some lunch before the beach then Juno Beach Cafe is your place. 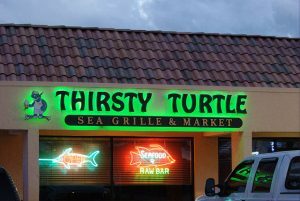 The restaurant is conveniently located at the intersection of U.S. 1 and Donald Ross Road, just a short walk away from the Atlantic Ocean and one of the nicest beaches in South Florida. Need a suggestion, go with Uncle Eddie’s Pancakes, can’t go wrong. 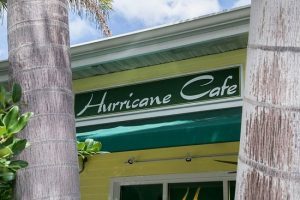 Another cafe a-hop-and-a-skip away from the beach, Hurricane Cafe, offers a diverse and ever-changing menu selection using only the freshest ingredients. Zagat Rated ‘Excellent’ for over 12 years, Voted ‘Best Breakfast and ‘Best Lunch Spot. Trip Advisor ‘Excellent in Customer Service’ & Talk of the Town ‘Excellence in Customer Satisfaction’. A popular location on weekend mornings, so be sure to get there early because parking is limited. Hidden away in Juno, Captain Charlie’s is a casual seafood restaurant with friendly service, featuring fresh fish and local tastes. Highly regarded and very popular with locals. For the wine lovers, Captain Charlie’s has an extensive selection; 52 wines by the glass! Many special wines by the bottle also (Mostly U.S. wines). Captain Charlie’s is a local hotspot that brings in tons of customers, so try and get in there during those off hours, trust me it’s worth the wait. Want a taste of the Caribbean, with a splash of Florida flair? 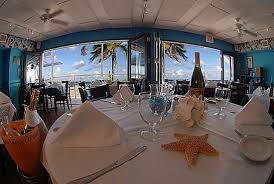 Then get your Floribbean on at The Juno Beach Fish House. The full-service restaurant features a fresh, local seafood menu with a Floribbean flair. The restaurant has really worked to be one of the top restaurants in the area since opening back in 1988. “Quality is the main ingredient, it speaks for itself, we take full advantage of the beautiful waters we live by.” – Head Chef Glenn Cockburn. 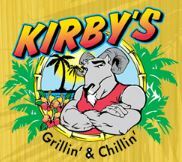 When the game is on, there’s no better spot to watch your favorite team with a nice cold beer in hand than grab Kirby’s Sports Grille. The owner is from Maryland so don’t doubt our suggestion: the Monday Special Crab Cakes, these are the real deal. This place offers a more local feel than most other restaurants on this list, so give it a try if you’re feeling lucky, maybe some Irish will rub off on you! 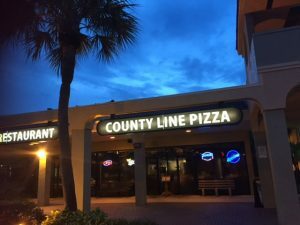 It might seem odd to include a pizza place amongst other restaurants, but since County Line Pizza has been making pies for over 50 years you deserve the recognition. Now I know, I know, this is technically a Jupiter icon because it was located on County Line Road in Jupiter for 20+ years before moving to the Juno location, but hey it belongs to Juno now. The owners are very kind and have continued the restaurant’s great success. If you love good pizza and Tom Brady, this is your new Sunday hangout. 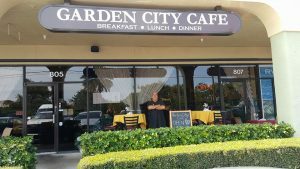 A local hotspot for Sunday brunch, Garden City Cafe is newer to the area but with $11 Bottomless Mimosas/Bloody Mary people might be coming here for a long time. A local quaint, laid-back gem located next to Dunkin Donuts on Donald Ross, you can often find someone strumming a guitar with some live music. It is definitely a cool environment with a variety of food and local artwork throughout the restaurant. Be sure to give this place a try this weekend! In the mood for that authentic Italian taste that only Mamma could make back in Jersey? 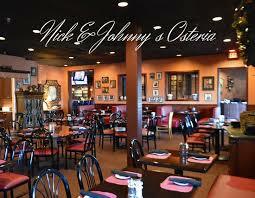 Well, look no further than Nick & Johnny’s Osteria. This place offers that classic Italian feel, the kind that makes you feel at home as soon as you walk in the door and see the family photos dotting the walls. 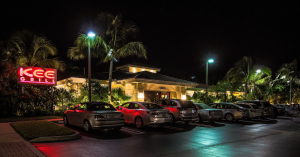 The followers of Nick’s Tomato Pie in Jupiter have had to deal with the change of location, but with such quality Italian food and even better service it makes you feel like you are part of the family. Benissimo! And two extras, because why not? If you are feeling extra healthy or want to get your juice on, 3Natives located on the edge of Juno is your place. Although there are various locations this is their busiest location and (in my opinion) their best location. 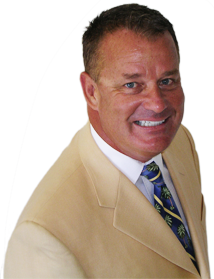 3Natives was founded in 2013 in Tequesta, Florida by Anthony Bambino. What started out as a small 900 sq. 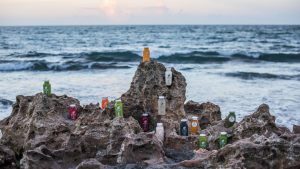 ft. juice bar has quickly grown into 11 storefronts serving Florida. The “Chuck Norris” has been said to be so delicious that Chuck Norris himself gave it 10/10 on Yelp! 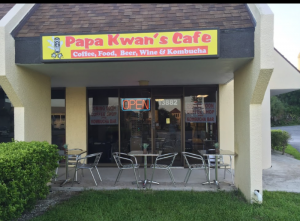 Independently owned with the beachiest vibes around, Papa Kwan’s Coffee Bar is your go-to place for great coffee and Hawaiian music. Being an independent shop, they continue to offer customers high-quality products, including organic coffees, as well as having the flexibility to change the menu daily. Every day you will find something new on their menu. The small coffee bar provides a pleasant relaxing “Tropical Island Feel” and creates an environment that brings a smile to your face.